"Your revolutionaries will be your downfall, and with it, the King's." At age 82, French auteur Eric Rohmer makes a departure from his masterful contemporary works, taking only his third excursion into the world of period drama with L'Anglaise et le duc. This historical piece takes place in France during the 1790s, based on the memoirs of Mrs. Grace Dalrymple Elliott in her Journal of My Life During the French Revolution. Elliott, a Scot by birth, had left the husband who gave her his name. Her affair with the Prince of Wales (later King George IV) had borne him a daughter, but his friend Louis Philippe, the Duke of Orléans, later became Elliot's lover, moving her to France in 1786; the two remained good friends even after their affair had ended. Philippe's relationship with his cousin King Louis XVI was a strained one, with Philippe often bearing ridicule, and he despised the queen, Marie Antoinette, who reciprocated in kind. With the uprisings in October 1789 the duke was sent to England, accused as a conspirator in the Revolution. The story begins in 1790, on the first anniversary of the fall of the Bastille, when Philippe (Jean-Claude Dreyfus) returns to Paris to dispel rumors that he is a cowardly �migr�. He urges Grace (English actress Lucy Russell in a French speaking role) to return to England to escape the growing unrest that has seen the sovereign unseated. In return, Grace is concerned with the Duke's presence in his homeland, fearful that he is being manipulated by fair-weather friends seeking to place him in a position of influence for their own benefit. Their relationship is sincere, and one of mutual respect, but each worries about what lies ahead for the other. Grace feels she is honor bound to the Queen, and that as long as she can visit her, she must remain in France. As the mood of the populace darkens in the following years, Grace's security as a friend of the royal family is jeopardized as the mobs burn the Tuileries Palace, and begin calling for the death of the monarchy. After briefly fleeing to Moudon, Grace returns to Paris at the beckon of someone claiming to be a friend of Philippe's, but her return opens her eyes to the dangers around her. Secreting a former charge of the Duke's, but one he now detests, from the routing of the Jacobins, her safety is in jeopardy. 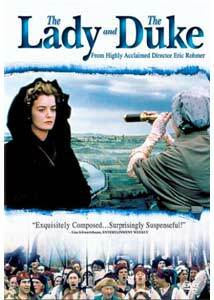 When the Duke learns of her activities, he assists her in concealing the fugitive, warning of the grave danger she is placing herself in. When the king is called to trial, the two become at odds over Philippe's position in the Assembly, with Grace hoping he can use his influence to save the monarchy, while Philippe is mindful about being seen as too closely allied to a king who has lost all popular favor. The story evolves over a span of several years, encompassing a number of key historical events, culminating in the Reign of Terror. The plot moves at a leisurely pace, using intertitles to note jumps in the timeline. Rohmer's work can hardly be described as conventional and here, he takes an extremely daring approach to his production. Rather than try to recreate the period through elaborate set dressings or locations, he instead hired artist Jean-Baptiste Marot to create exquisite perspective paintings of all the exterior settings onto which the three-dimensional, real life action was digitally overlaid. The artwork is magnificent, and the effect surreal, as actors and their horses or carriages appear and disappear against the two dimensional background through arches or doorways. Interiors are given a similar trompe l'œil, treatment with the relief detail painted onto flat panels. While this works to a degree and certainly gives the film a very unique look, its artifice does become distracting at times. True to form, Rohmer unfolds his story through dialogue, with most of the action occurring off screen and revealed in conversation. He concentrates on his characters and their conflicting moral views: Elliott the staunch royalist, unswayed by the perils of her convictions, and unflinching in her resolve; Phillipe, by contrast, easily corrupted out of fear for his own life, and political aspirations. Their differences create the tension on which their bond of loyalty and love is balanced, leaving each to weigh the value of the other's philosophy against their own. Both Russell and Dreyfus do an admirable job, but there are periods where repetition and the fairly theatrical style of the film detract from the actors' effectiveness. Like their surroundings, the characters often feel sterile and one dimensional, lacking the richness and subtle complexity one associates with most of Rohmer's work. In the end, I am left somewhat on middle ground, appreciating the creativity of the vision and the drama of the story, but wanting more compassion for the characters. Image Transfer Review: The anamorphic widescreen image is excellent, capturing the subtle hues and details of Morot's artwork, along with the rich interior details and costuming. Blacks are strong, shadow detail very good, and print defects negligible. On a smaller screen, the backgrounds blend in fairly seamlessly, but some aliasing and hard edging betrays their presence on a larger setup. Audio Transfer Review: The French 5.0 track is presented well, with good frequency coverage and an enveloping soundstage. Directionality is used sparingly and to good effect. Dialogue is clear with no signs of distortion. There is some issue with lip sync during the first scene, but this may have been intentional. Extras Review: Only trailers for Happy Time, Sunshine State and The Lady and the Duke are included as supplements. The Lady and the Duke presents a compelling tale, and a grand experiment in the use of digital technology, Rohmer's first foray into the medium. While the circumstances are certainly dramatic, and Russell deserves credit for pulling off her role in a non-native language, the result is slightly disappointing, missing that subtle magic that the director has made his trademark. I would still suggest the curious indulge themselves, as this is a spectacle to behold, but doesn't quite live up to my higher expectations for this artisan, and will certainly try those unused to the director's style.